The Bunny Fighter Club – Eduard’s special membership club for all modeling enthusiasts! 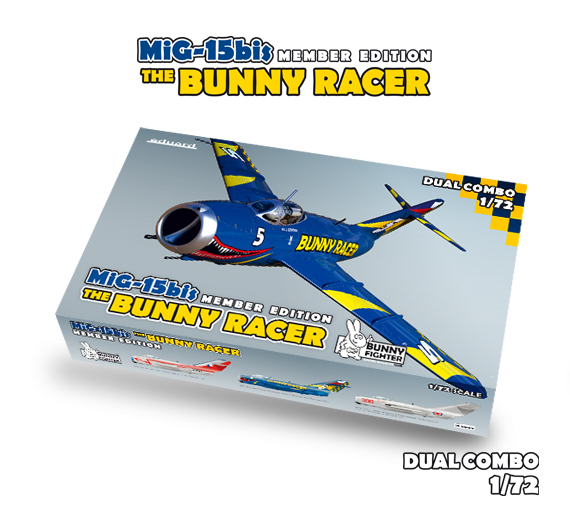 Eduard’s Bunny Fighter Club brings many advantages and special limited products to all modelers worldwide. Join the most exclusive modeling club ever known and enjoy the benefits and bonuses of Eduard’s Bunny Fighter Club. Box contains sprues for two complete kits of MiG-15bis in 1/72, 3 marking options on colorful decal sheet, photo-etched flaps and exterior details, painting mask, superfabric seatbelts and bra, Brassin cockpit and wheels (4 pieces) and Member Edition T-shirt of selected size. Kit contains plastic parts, PE sets and masks for two models of Bf 109G-6 in 1/48 scale. Decals for 4 markings, Brassin cockpit, propeller and wheels (one set each). Member Edition T-shirt of selected size. 15% Permanent Club discount at Eduard Store – you will receive permanent 15% discount on all Eduard products and also discount on various other non-Eduard products. Fixed, permanent, forever! Unique valuable Club kits and accessories – you will gain access to unique and nowhere else to be sold products, specially made for BFC members. Even better prices at Eduard events stand – do you know that Eduard usually has huge discounts on their products at fairs and events all over the world? BFC members will have even higher discount at these events. Club T-shirt – you will receive fancy BFC T-shirt with unique design and special barcode (used for event discounts). This exclusive T-shirt will be only available to the members of BFC. Free entry fee on E-day – you will not have to pay a penny to visit Eduard’s E-day. That means lot of fun at E-day for two days and entry kit, absolutely free! How to become a member of BFC? 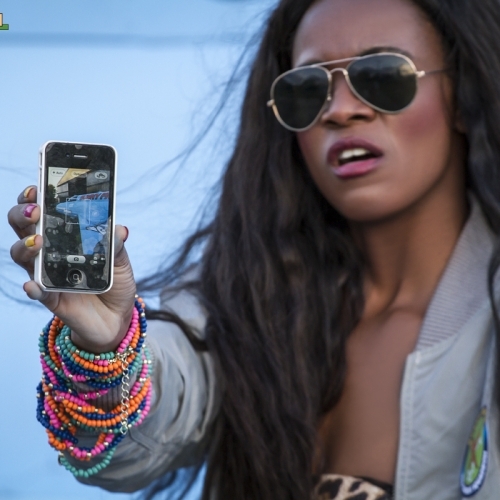 - Simply by purchasing the Activation product. What’s my discount when I’m purchasing the Activation product for the first time? - You will be given 15% discount on (almost) every Eduard product in your shopping cart. To apply this discount, the Activation product has to be in your shopping cart. Activation product is excluded from this calculation. When will I become a BFC member? - BFC membership will be automatically activated 2-3 days after the dispatch of your BFC kit. You will be notified about this by email. Can I buy two kits with one account in order to activate two memberships? - Each custumer has to order the Activation product using his own registered account. By purchasing more than one Activation product only that one account is eligable for membership. Can I buy one kit with two T-shirts? - The T-shirt is part of the activation kit. In order to obtain two T-shirts, you’d need to purchase two activation kits. Will there be other Activation product in the future? 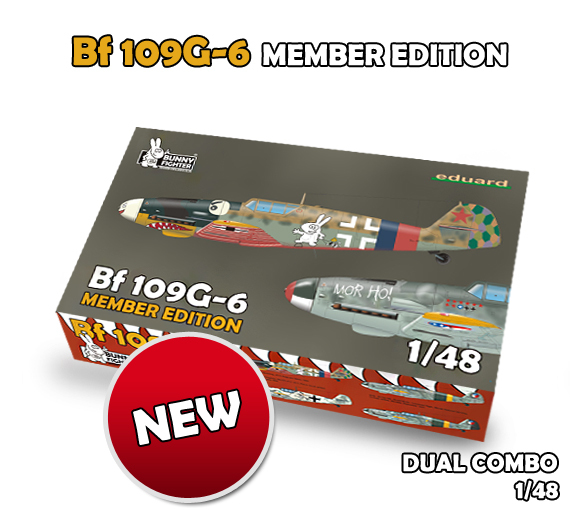 - (other scales, AFV, ships) – To this date, there are only two Activation products – the Bf 109G-6 Dual Combo 1/48 and the MiG-15bis Bunny Racer Member Edition 1/72 (BFC009). We might consider to make AFV or ships related Activation products in the future. Check out our BFC promotional video on our Youtube channel!